CHV’s web-based community collaboration products are designed to overcome the communications barriers within agency silos that often inhibit collaboration and the critical sharing of information necessary to building strong community partnerships. With the CHV products, community partners and government agencies can and do share unrestricted information while protecting the more "restricted" data such as information restricted by HIPAA or other controlling laws. CHV provides clients with a secure web-based tool that facilitates the sharing of their unrestricted information in the collaborative delivery of community based treatment services. The CHV products also provide the ability to collectively case manage a complex multi-agencies treatment plan for at-risk clients. 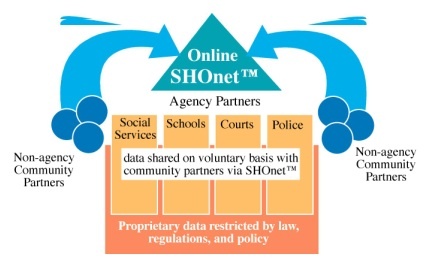 The CHV web-based products are designed to empower community partnerships in their efforts to knit together public and private partnerships in the case management of these at-risk populations. Examples of the CHV software products at work have included programs for indigent health populations, juvenile serious habitual offender community programs, and juvenile re-entry initiatives. In addition, work is currently underway to use the products with adult prison re-entry community based collaborative programs.